In this still frame from a MGM Hearst "News of the Day" Newsreel, Moscow citizens dig an anti-tank trench outside of Moscow in October 1941. 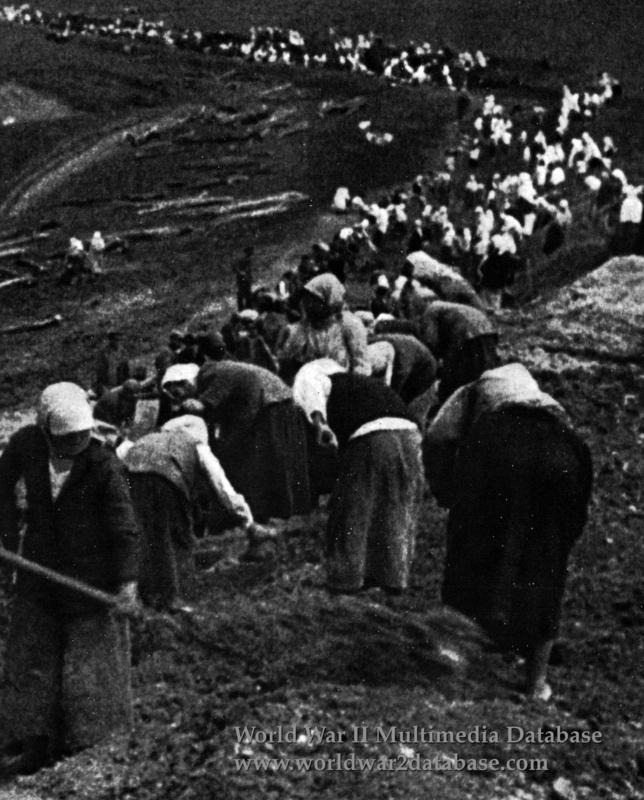 After the fall of Smolensk in July 1941, 200,000 people were mobilized to dig fortifications along the Mozhaisk Defense Line sixty miles outside Moscow, mostly by hand, in what citizens called the "Labor Front." Three-fourths were women because so many men were drafted for combat. General (later Marshal of the Soviet Union) Georgy K. Zhukov (December 1, 1896 - June 18, 1974) ordered the organization of civilian construction battalions partly to quell rising panic as the Germans approached. The Soviet government had to allocate a thousand tons of sheet steel for spades and pickaxes, because tools were in short supply. German aircraft machine gunned the workers and food, water, electricity and shelter were lacking. Workers contracted lice and other diseases. The Germans reached the line in October, but it was not finished because of a lack of heavy tools, concrete, engineers, and land mines. Barbed wire entanglements were often not even built. One worker digging between Moscow and Kuntsevo, Olga Sapozhnikova, later wrote, "There was a very large crowd of us, and we were told to dig trenches. We were all very calm, but dazed, and couldn't take it. On the very first day we were machine-gunned by a Fritz who swooped right down on us. Eleven of the girls were killed, and four wounded." Other Muscovites dug a four-mile trench at Naro-Fominsk. Antonina Savina lived on one sausage and a small roll of bread a day while digging an anti-tank ditch at Serpukhov, less than a mile (two kilometers) behind the front line to the South of Moscow. They had to bring their own bedding and the ladge owner refused to heat their quarters and they had no water. All of the workers got lice, and Savina rushed them out of her hair and pulled them out of her bra and burned them in the candles that lit their quarters. When she returned to Moscow, her sister shaved her head and burned her clothes.